One product I have really been loving in these warmer months is a perfume. 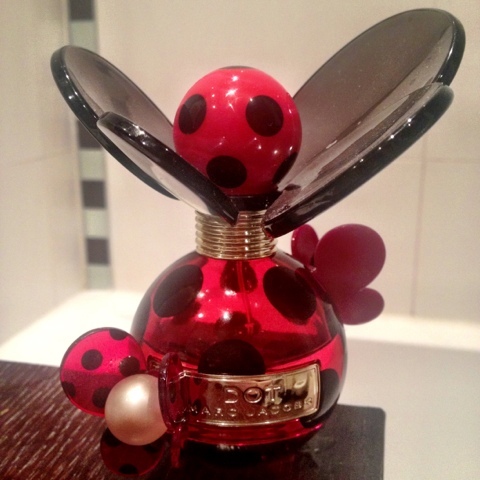 Daisy by Marc Jacobs has been my 'signature perfume' for years now but a new addition came into my life on my 22nd birthday when my boyfriend bought me Dot (also by Marc Jacobs). The packaging is absolutely horrendous but I guess it is what's inside that counts and in this case I really like it as a Summer fragrance. I am awful at describing scents but I will do my best as well as telling you all what the actual notes of this fragrance are. I tend to like quite sweet, warm fragrances such as Prada Candy but I do find that to be a bit too much in the warmer months when I want something a little bit more fresh. This perfume smells sweet but a lot more fresh and fruity than other scents I tend to go for. However, it still has that warm vanilla and jasmine smell that I really love. I think it is because those are not the top notes that they don't come out quite as strongly as the more fruity notes. It is quite interesting that this perfume is fruity, fresh, floral and sweet all at once but it is by no means overwhelming. I guess the only real way to tell if you will like a perfume though is to have a sniff of it yourself. If like me you tend to like sweet, warm scents but you want to try something a bit different for the Summer time then I recommend going to have a whiff of this one. What's your current favourite Summer scent?